We specialize in the design and construction of quality timber patios, pergolas, carports, gazebos, decking, balustrades, steps and fencing. 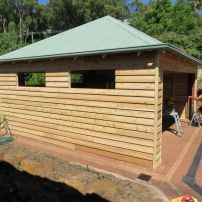 Founded in 1990 this family carpentry business is run by Geoff and his son Trent. They deliver a high standard of workmanship and can help transform your home or garden into an attractive and functional space for you to enjoy. 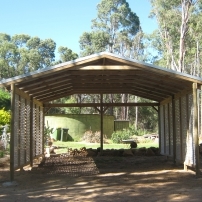 Kamelot Constructions services mainly residential clients in the Perth Hills area including suburbs of Beechina, Boya, Chidlow, Darlington, Ellenbrook, Forrestfield, Gidgegannup, Glen Forrest, Greenmount, Helena Valley, High Wycombe, Hovea, Kalamunda, Lesmurdie, Mahogany Creek, Maida Vale, Midland, Midvale, Mount Helena, Mundaring, Parkerville, Paulls Valley, Sawyers Valley, Stoneville, Swan View, The Vines, and country towns located east of Perth, including Brookton, Beverley, Cunderdin, Goomalling, Morangup, Northam, Toodyay, Wooroloo, Wundowie and York. With their decades of experience, Geoff and Trent have the technical knowledge required to tackle any outdoor carpentry job. They can provide friendly advice and answer any questions clients may have about a project. The business uses quality treated timber as well as hardwood or composite decking boards sourced locally from reliable timber suppliers. Geoff and Trent guarantee all work, always waiting until the customer is completely satisfied before moving on. The business offers reasonable rates but does not skimp on quality. "We take great pride in what we do and we do it well" is our motto.